Lecture time and place: Monday and Wednesday 11:30-12:50 DH 253. Office hours: Monday and Wednesday 2:30-3:30. Instructor: Prof. Jianguo Lu, LT 5111. Email: jlu at uwindsor. Marks can be retrieved by typing in your student ID. You can review your final Dec 21 10am-4pm, and Dec 22 10am-11:30 am. Undergraduate Student Research Awards (NSERC USRA) are available. You are welcome to apply. (week 1) Course outline [ pdf], overview ( PPT, PDF ). (Week 4) MapReduce [PPT], [PDF] . (week 5) XSLT [PPT] [PDF] . (week 6) Logic Programming [Slides(PPT)], [PDF] . sample.pl, path.pl, snowy.pl. GNU Prolog can be downloaded from the gprolog.com web site. Supported platforms include Windows, OS x et al. It is also installed on machines in our school. Distributed object and object persistency [PPT] [PDF] . (Week 8, 9) Aspect Oriented Programming [PPT] [PDF]. (Week 10, 11) Axiomatic semantics[PPT] [PDF] . Garbage collection, type checking , . sample questions and answers . [Functional programming] Due date: October 9. Above classes have package declarations. To compile and run those classes, you need to put them in appropriate directories. 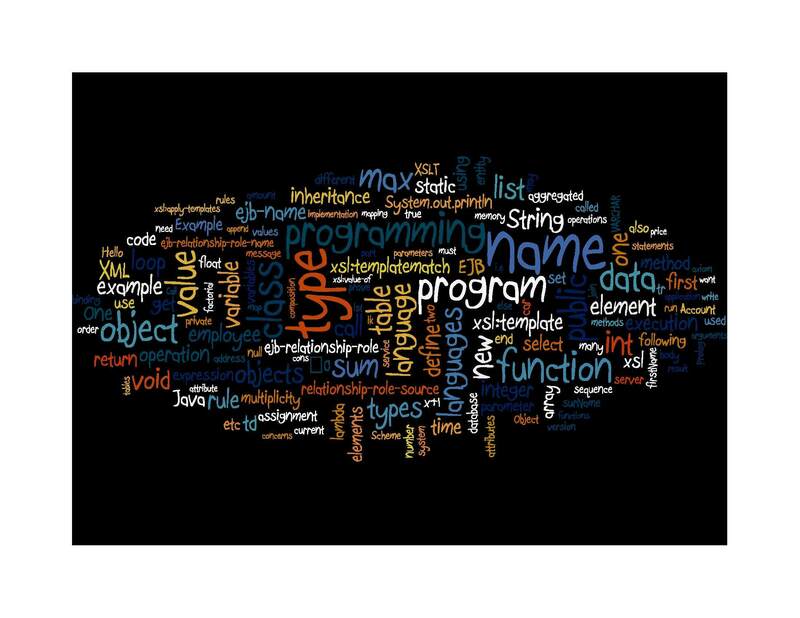 Popularity of programming languages gives the popularity of programming languages, updated once a month. C. A. R. Hoare revisits his axiomatic semantics paper, CACM 2009. DrRacket, a language derived from Scheme.